TGI-N-A-P-A-L-M-P-O-M release day! The Unconditional Love Of Napalmpom is OUT NOW! BUY IT?! If you dig what you hear, tell the world! 10/17, Calgary, AB – Napalmpom w/ The Get Down, Feel Alright @ Palomino Smokehouse BUY TICKETS NOW! Yup, the LP cover was designed to be coloured in, DoodleArt-styles. We’ve already done a few of our own and would LOVE to see more – take a photo of your cover and send them to us or use the hashtag #nppincolour on Instagram or Twitter and we’ll add ’em to our gallery! UNOFFICIAL GUITAR TAB BOOK? ALBUM COMMENTARY TRACK?! Now, the wanky stuff: some self-indulgent extra goodies are now available! 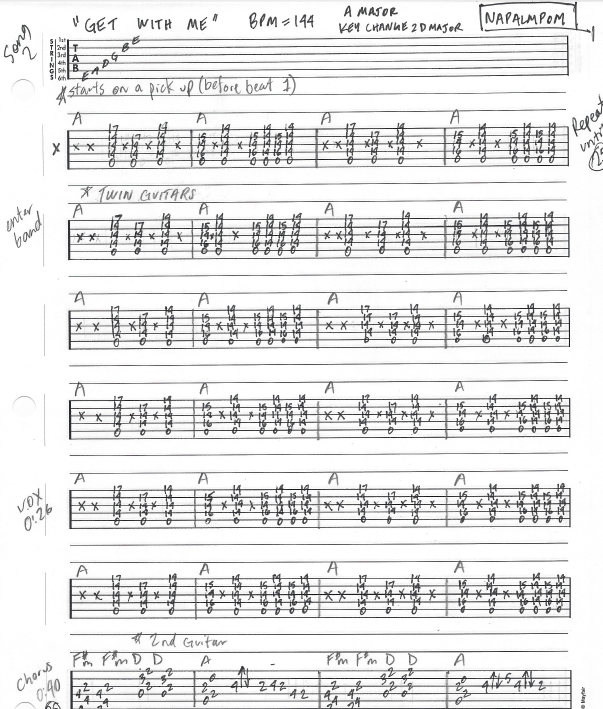 First, some anonymous musical savant and heavenly soul dropped off an ENTIRE GUITAR TABLATURE BOOK (!?!!) of our album off and we’ve scanned it and posted it to our website. We can’t vouch for 100% accuracy, but first glance it seemed pretty damned right! Second, we figured “hey, maybe no one else will talk about how awesome this album is, we might as well.” So we went and recorded an album commentary track (thanks Chixdiggit) with Lorrie Matheson. So, in conclusion: if you buy our album, we will love you unconditionally. You know, after that condition of you buying our album has been met? Rock & roll is loved.